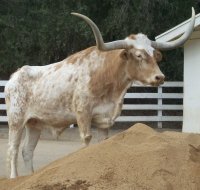 At the Leonis Adobe Museum our animals are part of the museum experience, representing an authentic ranch yard of the 1880s. 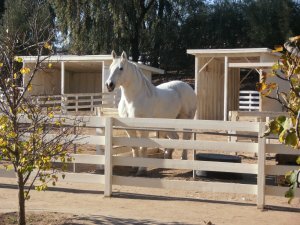 We offer programs throughout the year where visitors can meet, feed, and learn about the ranch animals that were so important to the people who settled the West. The Percheron is a breed of working horse native to France, one of the most popular large breeds in the world. The Percheron was developed in the La Perche region of Normandy (Normandy) from which it takes its name. 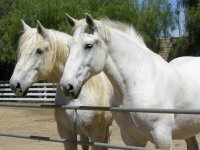 The Percheron stands between 15 and 17.2 hands high and is Gray or black in color. For such a massive horse, the Percheron is known for its grace and great poise. These are the horses that the knights in armor used for their mounts. 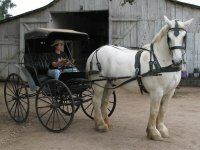 Thousands of Percherons were imported to Americans in the last half of the 19th century. The Percheron quickly became the favorite of both the American farmer and the teamster who would move freight on the nation's city streets. Percherons can weigh up to 2,700 pounds or more, but average around 2,000 pounds and can usually pull twice its weight. At the Adobe they were the equivalent of the family car and the farm tractor all in one. In 1493, Christopher Columbus brought Spanish cattle to Santa Domingo, and within two hundred years their descendants would be grazing the ranges of Mexico. No two Texas Longhorns are alike. They all differ in color pattern, size, horn length, and personality. Interestingly, both the males and the females have horns to fend off predators and to keep cool. Horns in animals are part of their heating and cooling system. A cow can lose heat from their horns, and help keep themselves cool. 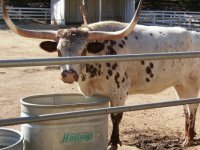 Longhorn cattle are intelligent, easy to work with and to handle. 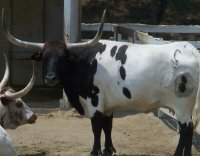 The Texas Longhorns boast lean meat and supple leather. They also have a longer life expectancy than other cattle. They have developed a natural immunity to disease and a resistance to parasites. 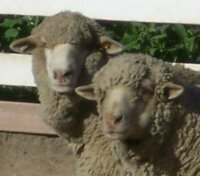 Female sheep are called ewes. 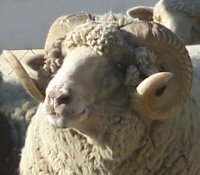 Male sheep are called rams. Babies are called lambs. Sheep usually live to be about eight years old. And weigh between 200 and 250 Ibs when fully grown. They hate to be alone--that's why they live in flocks (groups of sheep). Sheep are very gentle animals and are easily frightened. They flock together for protection because they can't really protect themselves. There are many different breeds of sheep. Some are raised mainly for meat and others primarily for their wool. Sheep eat grass and hay. 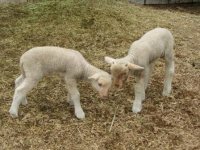 Sheep usually give birth once a year and have 1-3 lambs. One of the best things about wool fabrics is that they are flame resistant, so they are safer to wear. Wool also provides excellent protection from cold and wet weather. Race car drivers wear wool-lined suits to reduce their chances of being burned in a fiery crash. An official American baseball contains 150 yards of wool yarn. Sheep can be milked just like cows. Sheep's' milk is often used to make gourmet cheeses. Sheep's milk is different from cow's milk. It contains more protein and has a higher fat content. Sheep's butter is also used in gourmet food. The fat from sheep also known as tallow can be used to make both candles and soap. The tallow is cooked to purify it, and then molded into candles or further prepared into blocks of soap. Sheep can see more than us. They see almost 3/4 of a circle. This makes them very difficult to sneak up on or surprise them. Sheep feel things and have language. They use various sounds to communicate different emotions and messages among flock members. Goats were one of the first animals to be tamed by humans and were being herded 9,000 years ago. They are a member of the cattle family and are believed to be descended from the wild goat, bezoar. Goats are ruminants or cud chewing animals that eat cracked or ground corn mixed with oats, hay and grass. Goats generally live 10 to 12 years. Goats are very sociable, lively, inquisitive and independent animals. They are also quite intelligent and can learn how to open latches on farm gates. Goats can climb, run, crawl under fences and some breeds of goats are able to jump heights of over 5 feet. 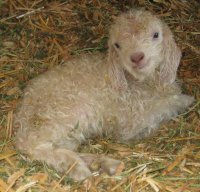 The main products associated with goats are milk, cheese, meat, mohair, and cashmere. "Buck or Billy" -a male goat. "Doe or Nanny" -a female goat. "Kid" -a young goat. "Wether" -a castrated male goat. The pupil in a goat's eye is rectangular in shape instead of being round like those of other animals. It is believed that goats have excellent night vision. There are over 210 breeds of goats with an estimated 450 million goats in the world (2001). 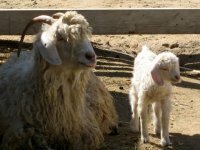 Depending on their breed, female goats weigh between 22 to 220 pounds, whereas male goats weigh between 27 to 275 pounds. The turkeys at the Adobe are called Black Spanish and are considered a rare breed. The eggs of a turkey are almost twice the size of a large chicken egg. The Aztecs of Mexico had domesticated the turkey long before any Europeans arrived. 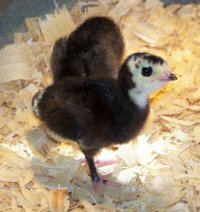 The male turkey is approximately 3' tall and weighs about 20 pounds. The female is similar although smaller framed and weighing only about 16 pounds. These large birds have a 40" wing span. The life span of a wild turkey can reach 12 years, although 5 years is a common life time. About 240 million domesticated turkeys are raised in the United States each year. The wild turkey can run at speeds of up to 15 mph (24 km/h). 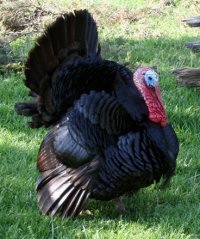 Turkeys sometimes eat frogs, lizards, snakes, salamanders, and crabs. The first meal eaten on the moon by astronauts Neil Armstrong and Edwin Aldin was roast turkey in foil packets. The ballroom dance the "turkey trot" was named from the short, jerky steps of a turkey. Each year in Nov. since 1946, the National Turkey Foundation presents the president with a live turkey. This turkey is pardoned by the president and sent to live on a historical farm. 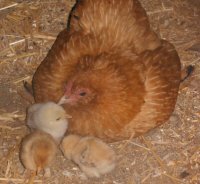 The adult female chicken is called a hen, the adult male is called a rooster, and the young are called chicks. Chicken eggs range in color from white to pale brown and other pale colors like green and blue! They eat insects, worms, fruit, seeds, acorns, grains, slugs, snails, and many other foods. Chickens have a well-developed gizzard (a part of the stomach that contains tiny stones) that grinds up their food. 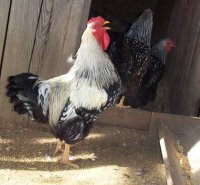 Chickens originally come from Southwest Asia. The chicken can travel up to 9 miles per hour running, but the longest recorded flight of a chicken is thirteen seconds. There are more chickens than people in tile world. They have a life span of up to 15 years. Like all pigeons, white doves eat mostly seeds. They drink by sucking up water (very few other birds do this). Male doves build shallow, saucer-like nests made of sticks and twigs. Nests are usually located on ledges, like seaside cliffs or window sills on skyscrapers. Females lay 1-2 white eggs in each clutch (a set of eggs laid at one time). 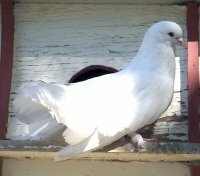 The White Dove is not the same bird as the white homing pigeon. 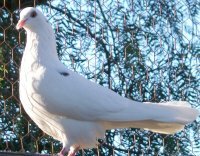 White Doves are very clean birds and love to bathe. White feathers are actually feathers that have no color pigments. 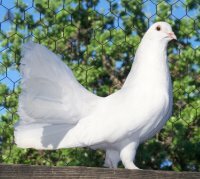 So, when you see white on pigeons you are actually seeing no color. They are social birds that live in colonies.